A modern car has many sensors monitoring how your car is behaving. If there's something wrong then normally the first you'll know about it will be a warning light on the dashboard. This is your cars way of communicating to you. 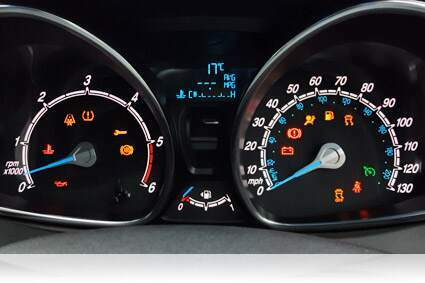 There are so many different warning lights and indicators. If you ignore an important warning light then you could put your safety at risk or end up with an expensive car repair bill. You can find certain dashboard lights in all cars and some are more specific for the make and model. 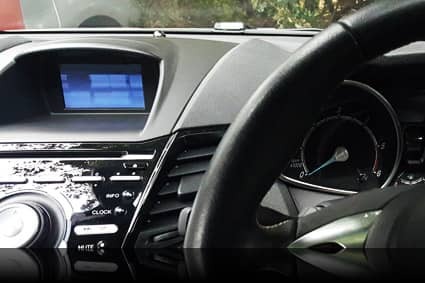 We'll explain what each of the dashboard lights and indicators are in our manual, diesel Ford Fiesta but always check in your owners manual as there might be some differences. When is it safe to enter roundabouts? Video on the different dashboard lights. When you start the car you will see some warning lights come on, but don't worry this is normal. It's just a routine check to show that they're all functioning. If certain warning lights stay on after 5 seconds of starting the car then there is a problem. Generally, red lights mean that there's a serious problem and you should stop your car as soon as it's safe to. If it's critical then it might also flash. Once you've stopped in a safe place, it's time to check your cars manual to find out if it's safe to carry on driving. Amber or yellow lights generally mean that something requires attention when possible or needs servicing. Green and blue lights confirm activation, such as your main beam headlights are on. In this Ford Fiesta, further information is sometimes displayed on this screen. If this one illuminates, then it means that you have a malfunction with your anti-lock braking system. The normal braking system will operate unless the brake system warning light is also illuminated. Get it checked when possible. When your ignition or engine is on and you're stationary, you'll see this light which means the parking brake (handbrake) is on. If you see this light when driving then make sure that the parking brake isn't still on, if it isn't then it means either low brake fluid or a brake system malfunction. Get your car checked immediately. Driving with this warning light on is dangerous. This will illuminate when you have cruise control activated. These are your left or right direction indicators or the hazard warning lights. They'll flash when turned on. If the indicators stay on or flash faster than normal then check for any bulbs that aren't working. You will see this light if the bonnet, boot or any door hasn't been closed properly. There's a malfunction if this stays on after starting the engine or when driving. It's important to stop your car as soon as it's safe to and switch off your engine. Let your engine cool down for about 20 minutes and check your coolant level. If you have the correct coolant level and this still illuminates then switch your engine off and don't continue on with your journey. Have your car checked by an authorised Ford dealer. If this comes on when the engine is running or whilst you're driving then there's a malfunction. Pull up as soon as it's safe and switch off your engine. Check the oil level but don't continue driving if the oil level is correct and this light is still on. Have your car checked by an authorised Ford dealer. If either of these lights are on when the engine is running then there's a malfunction. Your car will continue to run but it may have limited power. If it flashes when you're driving then slow down as soon as it's safe to. If it continues to flash then avoid heavy acceleration or deceleration. Have your car checked immediately. If both lights are on together then stop your car as soon as it's safe. Switch the engine and ignition off and try to restart the engine. If it doesn't restart then have your car checked immediately by an authorised Ford dealer. If this doesn't go off or flashes once you've started your car then get it checked. This indicates that the front fog lights are on. If the temperature outside is 4 degrees or lower then you'll see this light. Wait until this glow plug indicator goes off before starting the car. This illuminates when you have the dipped beam headlights or the side and tail lights on. When you switch the main beam headlights on, you will see this blue light on the dashboard. It will flash when you use the headlight flasher. If you see this light when driving then there's a malfunction. Switch off unnecessary electrical equipment and have your car checked immediately by an authorised Ford dealer. This warns you that you have low fuel and to refuel as soon as possible. If you have your rear fog lights on then you will see this light. If you haven't got your seat belt on then you will see this light and it will make a sound to remind you. This informs you that changing to a higher gear may help to reduce fuel consumption and CO2 emissions. In this Ford Fiesta you will see it in the central information display between the rev counter and speedometer. This flashes when the stability control is operating. If this light stays on all the time while driving then there's a malfunction. If there is a malfunction then the stability control system will switch off and you should have your car checked as soon as possible. This illuminates if you've switched off the stability control. This light will come on when the engine has automatically stopped. When the engine needs to restart it will flash. You will see this light if one or more tyres are significantly under inflated. Stop your car as soon as it's safe to do so, check your tyre air pressure and inflate them to the correct pressure. Check if we cover your area for driving lessons.